The enigma generation. They grew up in the shift from analog to digital technologies. Surprisingly, they’re more likely to have a bachelor degree, live at home, and use a public library than other generations. They’re often categorized in over-arching generalizations, but are as diverse as the finches Darwin first saw on the Galapagos Isles that spurred his evolutionary theory. Millennials may be the most criticized generation in history. Love them or be bewildered by them. Believe in them or doubt in them. One thing is for certain, they are entrenching themselves in the workforce and ascending into supervisory, management and leadership roles, and if you want to take your business to the next level; you need to understand them. Who are they? What do they want? How can you align their wants and needs to benefit your business? Good questions deserve better answers. The age range is up for debate, but generally accepted birth dates range from the mid-to-late 1980’s to late 90’s. Some will argue this extends into the 2000’s, but that’s a minority opinion. Universally accepted is the fact that Millennials are the younger members of your staff, and will soon be followed by Generation Z, heralded as an even larger generation than their Baby Boomer and Millennial predecessors. Millennials are settling down later in life, and surprisingly, nearly half of them have said they either don’t want children or haven’t decided. 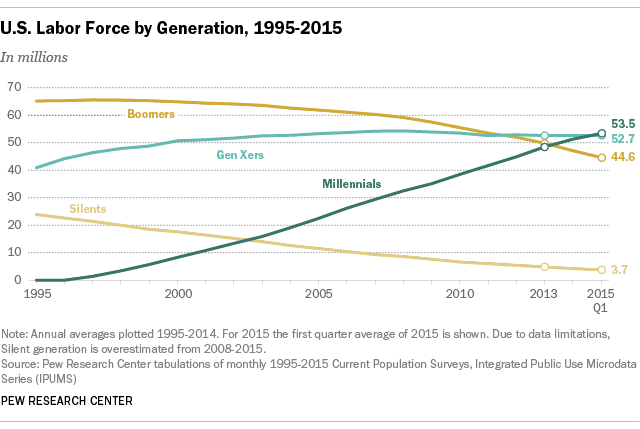 As of 2015, Millennials became the largest percentage of the workforce… and will be for quite some time. brand loyal generation, and the anecdote that Millennials lack loyalty begins to resemble a fable rather than fact. Millennials find the following traits most attractive in a potential organization: Opportunities for Career Progression, Competitive Wages (shocking), and Excellent Training/Development Programs. The Top 2 reasons for choosing their current job are: Opportunity for personal development, and the reputation of the organization. To the surprise of many, they value mentorship the most as a form of development. Rembrandt himself couldn’t paint a clearer picture; Millennials want a place to grow. They want to develop with an organization and co-workers they can connect with. They want to be mentored and developed inside of the organization. Be the organization that grows your employees, and your business will grow with them. What have we learned so far and how do we stitch this knowledge together to create an Action plan? What this is: Being transparent about your organizations health, demonstrating respect for each team member regardless of title, soliciting and listening to their ideas, and investing in your team, so they can reach a state of autonomy. 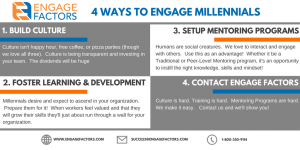 Millennials want to ascend in the organization, so prepare them for it. Invest in Learning and Development. Think about it, do you feel more engaged and motivated when someone invests in you? How about when they don’t? If workers feel valued and supported, they’ll run through the proverbial brick wall for you. Human beings are social creatures. We love to interact and engage with others. Invest in that. Match up Peak Performing, peer-level, co-workers in specific job duties with others learning each of the tasks. Have the “Peer-level Mentor”TM question the employee to measure her/his understanding of how to perform the task, making sure they have a clear understanding of the necessary steps/procedures. The mentor should be supportive and fill in the blanks if there is not clear understanding. The “Peer-level Mentor”TM should then model the expected behaviors by demonstrating how to perform the task the employee needs to learn. Afterwards, have the “Peer-level Mentor” TM coach and support her/his colleague to transfer their job knowledge of a given task into an on-the-job skill. Depending on the situation, you may also consider adding in a traditional mentor to help and support the employee, higher on the totem pole. Culture is hard. Training is hard. Mentoring Programs are hard. We make it easy. Contact us and we’ll show you. P.S. To make this content easily accessible to you at anytime, we’ve created this handy e-book.